What every girls needs right? A horse purse. Well, if you are a girl obsessed with horses this is the purse to make. I bought this craft kit at the Darling Harbour show from Central Park Patchwork in Victoria. It was extremely easy to make and a huge hit with Sloan. The materials supplied are beautiful quality and the finished product is exactly like the photos. 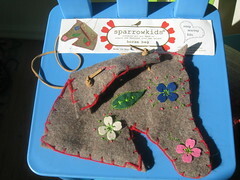 The kit is from the UK and here is a link to the Sparrowkids website. They have some gorgeous projects for kids. I am working away at the new quilt. You can get a sneak preview here. I have seen this project before on the net and have always wanted to make some for Sloan. Somehow these look so much more fun to play with than the numerous plastic accessories scattered throughout the house for her play kitchen. The link I used for inspiration can be found here. Some advice if you attempt to sew them, I made my first knife too small and it was very difficult to turn out to stuff. I wanted a very quick sewing project so the smaller you make them the more labor intensive the stuffing becomes. I also stuffed my spoon too much and couldn’t sew any grooves into it like I did on the fork. She loves them and they also double as drum sticks for my son. The kids had a great day crafting yesterday. 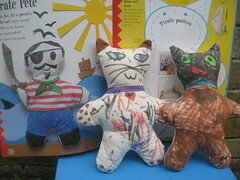 We checked out “The Crafty Art Book” by DK and Jane Bull and found this adorable pirate pattern idea that can also be made into a ghost or a cat. My kids latched onto the cat theme and took it from there. One of the little friends we had over is footy mad and we made his into his football hero. Big hit with him. We used some cotton fabric and Crayola fabric pens to draw the designs and I sewed them with helpers on the machine. A very fun and fast project that kept them busy. They book suggests stuffing it with lentils or rice, so I guess you could make them as rice pillows too for the winter. 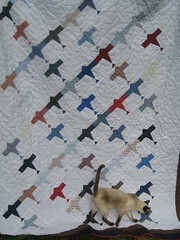 Three years ago I made a quilt almost identical to this one for my son. At the time I cut out this quilt with the high hope of completing it right after I finished Rhys’ quilt. Three long years later it has hit the light of day and is finished! I ran out this morning during one of the dry periods this morning to take a few photos. I am still working a lot of little “side projects” and just started a major quilt project for Sloan’s bed. Thinks lots of pink and dolls. 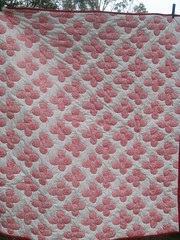 This pattern is called “Lucky Lindy” and I got it from the Big Book Of Best Loved Quilt Patterns by Leisure Arts. It was a very easy quilt to make and perfect for a boy. I would like to think my nephew will treasure this quilt at many ages in his life. Well maybe not when he is a teenager. : ) Men’s fascination with aviation never ends, so hopefully it will be a presence in his life. I am home today with a sick baby girl and hoping to sneak in some sewing time while she hangs out on the sofa. 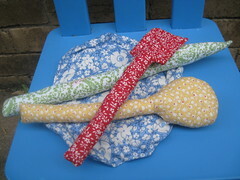 School holidays commence tomorrow so maybe some sneaky sewing between the myriad of activities Rhys has planned for me. Sigh.